The State Coach Britannia, a time capsule on wheels. To say that Australian born Jim Frecklington OAM (Medal of the Order of Australia) is a creative and innovative master coach builder and ardent monarchist is an understatement. As a former Windsor Castle employee who looked after Prince Philip’s four-in-hand team and later as a ceremonial carriage driver at the Royal Mews in London, he knows a thing or two about royal protocol, pomp, pageantry, horses, coaches and carriages. In 1977 he was invited to manage the Queen’s Silver Jubilee Exhibition in Australia which included her Glass Coach followed by assisting in the 1981 wedding procession for Prince Charles to Lady Diana Spencer. So how does one top that list of achievements? In 1986 Frecklington, with the go-ahead from Her Majesty and financial support from the Australian Government, designed and built the magnificent Australian State Coach that was given to The Queen in 1988 as Australia’s Bi-centennial gift to her. Today this coach is housed at The Royal Mews and is used on important state occasions. After the 2000 Olympic Games in Sydney, Australia, Frecklington had the nugget of an idea for an even greater project in mind. Fast forward to 2010 and Frecklington’s State Coach Britannia has been completed after years of work. It weighs in at 2.75 tons and is 18 feet long (5.5.m) and is 11 feet high (3.4m). It has electronic stabilizers, air conditioning, heating and power windows. However, what sets this creation apart is what is inside; it is a veritable time capsule on wheels and incorporates new age technology with over one hundred items and pieces of history drawn from hundreds of locations and from countless writers, explorers, scientists and inventors including: The Tower of London, Westminster Abbey, St Paul’s Cathedral, Edinburgh Castle, The Palace of Westminster, 10 Downing Street, Balmoral Castle, Blenheim Palace, Canterbury Cathedral, Hampton Court, Holyrood Palace and Kensington Palace. Items and/or segments have also been taken from the Battle of Hastings, the ill fated Franklin expedition, the Mayflower, the former RMY Britannia, a Battle of Britain Spitfire and Hurricane, a “Dambusters” Lancaster, part of a musketball from Waterloo, a sliver of Newton’s apple tree, as well as segments related to famous scientists, explorers and writers such as Charles Darwin, Edward Jenner, Scott, Shackleton, Hillary and Shakespeare. The crowning glory: hand carved and covered in gold. These items have their own pride of place and have been placed in handmade yew and ebony cases that contain 60 small gold-plated canisters with the Queen’s monogram inlaid in mother-of-pearl that is under the seats. The design details on this coach are staggering. • The gilded Imperial Crown that sits on top of the coach was hand carved by a master wood sculptor with wood that came from Lord Nelson’s ship HMS Victory. However, despite its historic past the crown features small media cameras inside to bring together past and present. 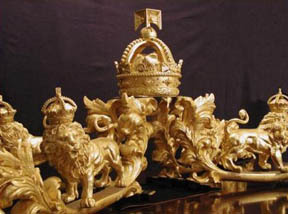 • The four exterior lamps were spun in brass, adorned with the Imperial Crown and then plated with 22-carat gold. The glass is actually hand blown crystal panels. 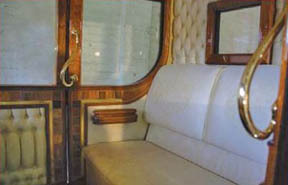 • The interior is lined and upholstered with 20 metres of the finest pale gold silk brocade woven in England. • The door handles are inlaid with 24 diamonds and 130 sapphires. 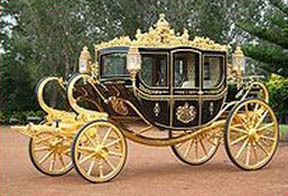 • The coach is covered with 9.35 sq metres (208 sq ft) of gold leaf. Inside: Heating, air conditioning and stabilized! Wikipedia tells us that: “Although completed in 2010, as of June 2012 the coach had still not been shipped to London.” So, the golden coach trail appeared dead but by Googling deeper and deeper I finally found a happy ending to this saga. In June of this year Logistics company DSV Australia confirmed it was planning to transport the State Coach Britannia and was awaiting approvals from Buckingham Palace to proceed; in July the splendid coach finally reached England. Attempts had been made to recoup the cost of building the carriage and sponsors were sought to reimburse all those involved. Today the State Coach Britannia is housed at the Royal Mews so the next time you are in England having tea with HRH, dash over and take a peak at this magnificent coach. It truly is a time capsule on golden wheels! in July the splendid coach finally reached England.???? No, it was still at North Head on Thursday 28 Feb 2013, but it was not there on Friday 1st March. It left for destinations unknown in a large enclosed truck at about 6PM the night before. Hi Geoff: Thanks you for the update! This saga seems to have a dead end…perhaps this magnificent coach will never get to the U.K. …what a waste..it seems quite unique. The coach was finally shipped by event and logistics specialists Gibson Freight Australia, not DSV. It has arrived safely in the UK last week. thanks so much for putting an end to this mystery with this information. Now, we can wonder, where will the coach end up? My goodness..will this coach ever see the shores of England? Thanks for the update Geoff!